No matter how complex or small a B2B sale is, it seems like nobody is ever ready to buy. Sometimes the best prospects will give you all the signals that there are ready to move forward, yet something always happens where they will have to push back until 6 months to a year. Having a lead nurturing strategy in the B2B space is the best thing you can do to stay on top of your prospects minds and keep them motivated to buy. Below are some lead nurturing tips to stay on top of your best prospects so you can always have a clean and accurate pipeline. Once your sales reps have figured out the buyer journey for a particular prospect, it’s good to start segmenting your nurture lists into different groups. Once group could be a list of prospects who are more far out to buy and at the top of the funnel and another list could be a group who are more close to making a buying decision. For prospects still in the top of the funnel, experimenting is key. Since they are in no hurry to buy and you are still trying to build awareness, try sending different pieces of content or changing your wording. You can tone down the frequency of touches and be patient to wait for the slow build. For prospects in the middle of the funnel, try to keep your frequency at once a month. Monthly touches of highly personalized content for your lead nurturing campaign is just the right amount to build value, be helpful, and build a relationship with your company and the prospect while not overwhelming your lists. Also, if your product serves different industries, segmenting by industry would be the proper move for more personalization and better engagement rates. I don’t have to tell you that spraying and praying is the thing of the past and due to technology, personalized campaigns have increased conversions for B2B companies significantly. After segmenting your lists, it is important to personalize your email marketing by each stage of the buying process that the prospects are in. Don’t send the same thing to everyone on your list. That is a road to get you less opens, clicks and engagement. Segment your list by prospects who are in the top of the funnel, middle, and the bottom. For the top of the funnel, focus on building more awareness of your company and brand. The middle of the funnel you can focus on content bringing the prospecting closer to making a buying decision. It’s important to know the pain points of each prospect on your list so you can send the right piece of content that can make their lives easier. Opens and clicks are great but responses are even better. The way you increase your response rate is to hyper-personalize the content and focus on helping the prospect achieve a particular result with each campaign. Try and figure out the problems your prospects have in their daily jobs and figure how your content can be relevant to them and how you can continuously help. The more personalized and relevant you are to your prospects and subscribers the more sales you can bring to your company. Link relevant content in your campaign. Something they can benefit from such as E-books, newsletters, whitepapers, blog posts, and videos. Keeping in touch with prospects is important but analyzing engagements is just as important. 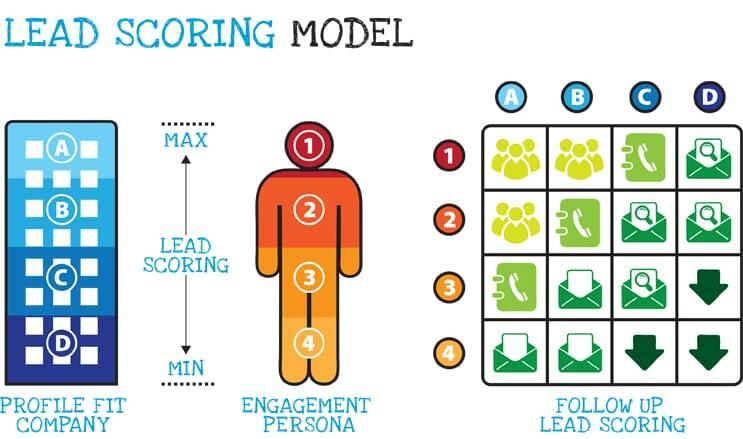 Lead scoring is a part of email marketing where you score engagements such as clicks, opens, or responses. Once a prospect reaches a certain score, marketing than alerts sales that a potential opportunity has been created. Put together a scoring list of engagements with responses being the highest, clicks being the next highest, and opens being the third. By analyzing the data off every campaign, once the prospect passes a certain score based off the links they have clicked on, this will be a properly qualified lead to pass to sales. In order to increase engagements and have higher lead scores, make the content as personable as possible and keep the pictures to a minimum. You want to automate your emails but also making sure you are presenting the campaign as something valuable and not spam. Most prospects are not in buy-mode, it is increasingly important for sales and marketing to align and strategize a long-term plan to stay in touch with prospects and continue to educate to eventually get the business. Generally responses from email campaigns are hard to come by so it is important to analyze the engagement activity and have sales reach out to vet the current interest. Once a prospect has reached a certain point of awareness, sales can come in qualify the lead even further and make commitments to move the deal further. Having SDR/BDR teams in this situation is crucial as they can vet the interest and timeline while asking the proper qualifying questions. If the lead is ready to take the next step, SDR team can hand the lead off to the account executive to work on the presentation and follow up to close the deal. It is increasingly important for B2B companies to have sales and marketing work closely together and strategize to list out targeted prospects. When misalignment happens, revenue can be severely affected and things can go south quickly. Sales and marketing should have monthly meetings to go over new potential targets, targets that need to be put back into nurturing phase, and strategies for specific targeted account penetration. The more sales and marketing teams can collaborate on things like lead nurturing and sales qualified leads, the more successful a company will be moving forward.